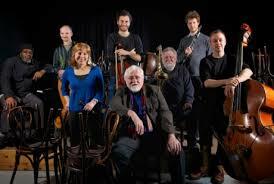 It was a scene that I'll cherish: Evan Parker standing outside the porch of St Margarets church looking for all the world like a priest of hip welcoming his flock, with chirruping birds adding to the bucolic charm. His flock, in this case, included the best improvisers from this generation and the one before, who had gathered under the banner of Mopomoso. This lovely parish church in the Manchester suburb of Whalley Range was the surreal venue of the last date of a national tour. The warm-up act, special to Manchester, were the Matt Wand Trio, comprising Wand himself, poised over a table-top of electronics like a boffin over his test-tubes, David Birchall, playing guitar in a refreshingly un-guitar-like way, and Richard Harrison, diamond hard on assorted percussion. It was the most convulsive and edgy music of the evening. Whatever else they were about, the Mopomoso musicians were not convulsive and edgy. Evan Parker, up next, has arrived via an unprecedentedly radical route to the stage of development that comes to great saxophonists in their maturity: he has become a fantastic balladeer, with a full, beautiful tone capable of conveying and inspiring deep emotion. This, without compromising any of the freshness and surprise of free jazz. John Edwards and John Russell provided a backdrop of strings: with Edwards' muscular bass giving momentum and propulsion to Russell's random scatterings and atonal scrapings on guitar. The music was more organic than chaotic, always with Evan Parker at the centre, still making discoveries and still inducing goosebumps with his circular fire-breathing. And that was only the first half in this feast of free, as rich in rampant creativity as Derek Bailey's Company gatherings, or those LMC weeks at Conway Hall I used to attend, or even the late lamented On the Outside festival in Newcastle. Clarinet and voice duo Alex Ward and Kay Grant embodied virtues supposedly banished from free jazz, such as subtlety, charm, and melodicism, weaving lines together in perfect tunefulness. The conventional classical maestro was consigned to the past by the string trio of Alison Blunt, Benedict Taylor and David Leahy, who thrive on instant, instinctive composing. This approach is much more open to the moment, as when double bassist David Leahy, on guard against conventional string trio harmonies, suddenly let rip with a bass flurry, and set the violin and viola scampering like agitated tadpoles. After so much pure pleasure, it was left to Pat Thomas to restore the reputation of free jazz for searching rigour. He was 'inside' in more senses than one, leaning into the piano frame and plucking the bass strings of adjacent notes, creating a dissonant rumblings. Harsh? Difficult? Not when the search resulted in low register cascades that emulated the electronica of drum 'n' bass by pure acoustic means. All the musicians (barring Matt Wand's trio and John Edwards) came together for the finale, and the greater size of the aggregation, if anything, made the music slightly more structured and well-calibrated. It was string-driven, with violin, viola, guitar and string bass to the fore, with a wordless voice and a clarinet pitching in, and Pat Thomas, still buried under the piano-lid, adding to the texture with scrapers and wood-blocks. Above all, and in a different tonal register from anyone, Evan Parker was more lyrical than less fearsome. The awareness that this beauty was only of the moment, or perhaps, more prosaically, that it was the last night of the tour, made for an almost tearful parting. I left with a very full heart, ready to embrace everyone in sight, musician and patron alike.